During my holiday in Italy, I was a bit disappointed that the choice for vegetarians was very limited. Margherita pizzas, pasta with tomato sauce, pasta with mushrooms or cold grilled vegetables. Usually it would be grilled eggplants, zucchini and pepper. No garlic or onion flavour and forget about getting any chilli flakes. Pizza hut and Dominos spoil us by giving us endless satchets of chilli flakes. Italian restaurants in India and Kenya give us chilli oil, yummy chilli sauces, pestos that are chilli. However, visit any restaurant in Italy and its difficult to find any of those extra condiments… no extra olive oil, chilli oil, chilli flakes, salt or pepper ! I had vowed to my hubby dear that once we get back to Mombasa, I was not going to buy any eggplants for a long time. On my return, dear Esther, the veggie lady who comes door to door, brought lovely huge eggplants. I didn’t buy them. She comes the next day with fresh ones again and I just couldn’t resist. To make me not hate eggplants I prepared my usual brinjal potato shaak to bring bake the taste of eggplants with masalas and spices and not bland as served to me in Italy. Third day she comes with more eggplants. I bought them and hubby dear thought I was going nuts. Going through my diary and trying to get back to routine remembered that I had to make my pizza for the We knead to bake challenge. The challenge is a different topping, different base or both. 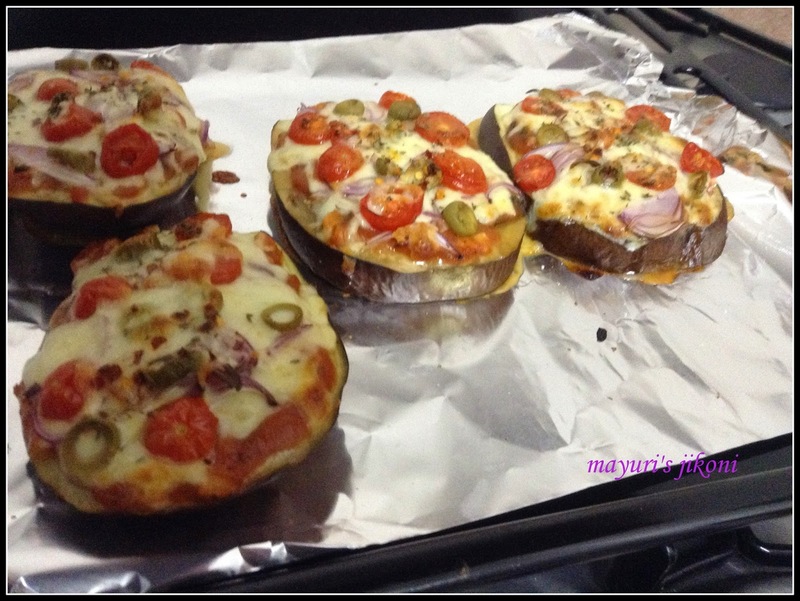 Wanting to eat a bit healthy after all the sweet croissants and pizzas I decided to bake the following pizzas for dinner. I loved it, hubby dear missed the normal base. Did you know that a normal cheese topping slice of pizza has about 290 calories. The calories go up with additions like extra cheese, chicken, pepperoni, paneer,etc. I love having pizza at our local Italian restaurants. Even the thin crust ones add up to 1200 -1400 calories for a 8 to 10 inch pizza. Our last day in Rome was a relaxing one as we had booked a room at Relais Il Casale, Ostia Antica. It was a beautiful place, an agri touristic place with lots of greenery around. They had a bbq place where families come during the weekend to bbq and have fun. Besides the natural bbq place they had an antique pizza oven. It was apparently used long time ago by the forefathers to bake pizzas. Pizza actually originated in Naples as a poor man’s meal where the bread was topped with tomato puree, meat and cheese.Since then pizza has become an international dish. The Italians believe that the typical pizza with tomato (red), basil (green) and mozzarella cheese(white) represents the Italian flag, just as Queen Margherita preferred. Thus the name Margherita pizza in her honour. Preheat the oven to 180°C. Line a baking tray with foil or grease it lightly with oil. Trim the stalk off the eggplant. Cut it into 4 thick slices lengthwise.Each slice should be about ½ inch thick. 2 slices will have a curved bottom. Slice it slightly to make it sit well on the tray. 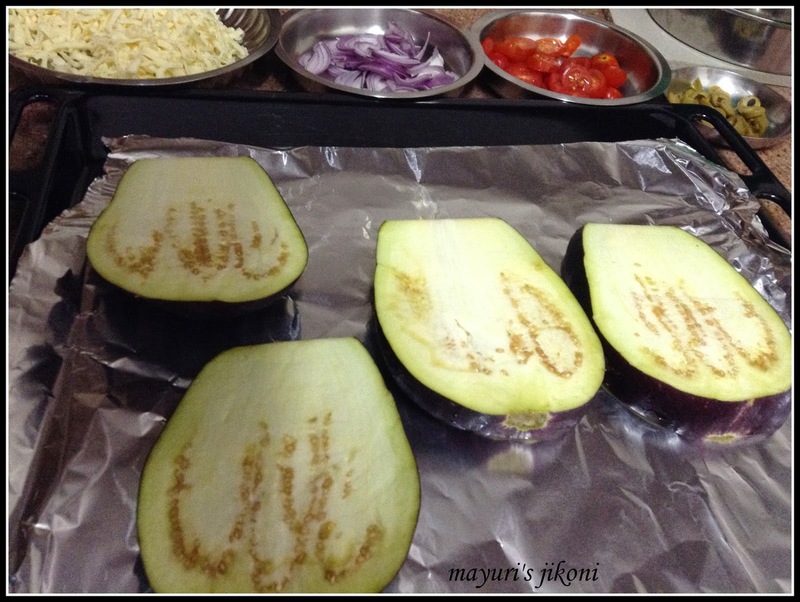 Place the eggplant slices on the tray. Sprinkle salt over the slices. Spread the pizza sauce over the slices. Sprinkle the cheese over the sauce. Top it with the sliced onions, chopped tomatoes and olives. Sprinkle chilli flakes and dried herbs. Bake for 18 to 20 minutes or till the eggplants are done and the cheese has melted and is bubbling. Top with fresh basil leaves and serve immediately. 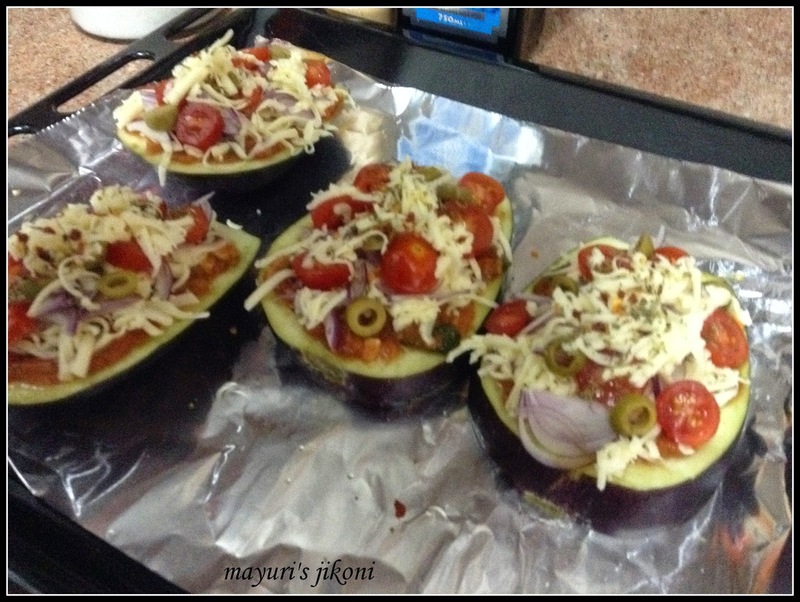 Make sure that the eggplant slices are not thicker than ½ inch or else it will not bake well. Add topping of our choice. Add cheese of your choice. The knife should cut through easily if the eggplant is done.